This recipe comes from one of my favorite cookbooks ‘Clean Food’ by Terri Walters. 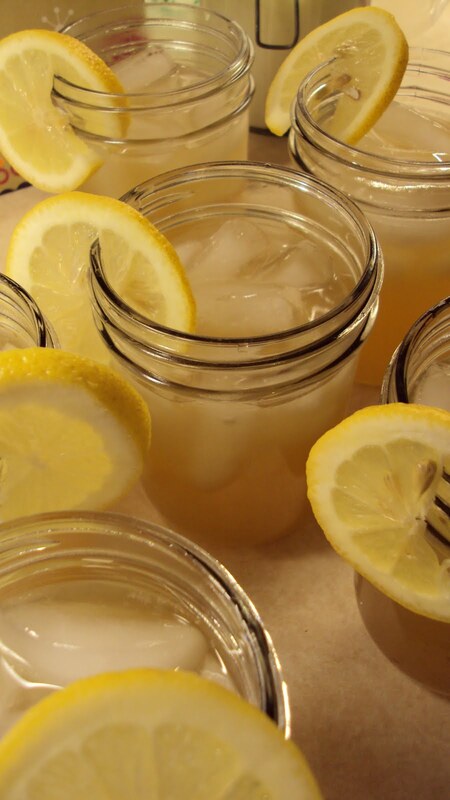 She says it helps replenish her adrenals, but is refreshing and satisfying too. I agree! 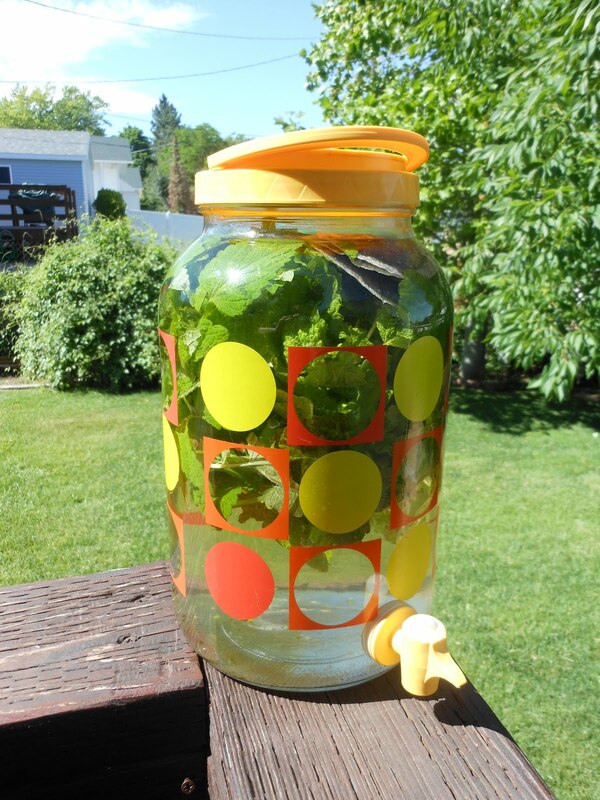 I love this tea in the summer, it’s easy to make, taste great and is good for you. 1. In a large pot, bring water to a boil. Remove from heat, stir in herbs and agave, and set aside to brew and cool for at least 1 hour. Pour tea through a fine mesh strainer into a pitcher (I pour mine into and ice tea decanter). 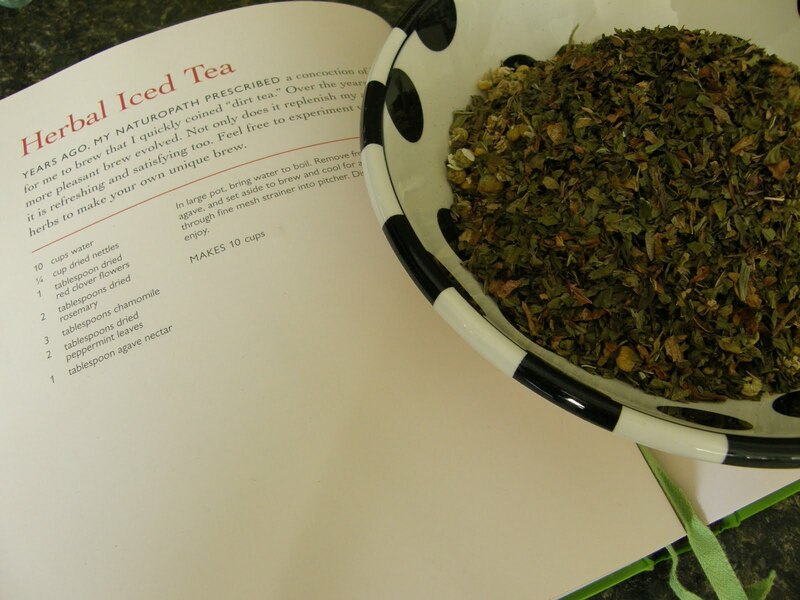 Discard herbs, chill tea and enjoy! *Nettles: Have been studied extensively and has been shown promise in treating Alzheimer’s disease, arthritis, asthma, bladder infections, kidney stress, prostate enlargement and tendinitis to just mention a few. Its also has been shown to calm the nervous system and balance hormones. *Red Clover: Has a good amount of vitamins, proteins and minerals. Contains minerals that assist in bringing about hormonal function. It is also an effective liver and blood purifier. 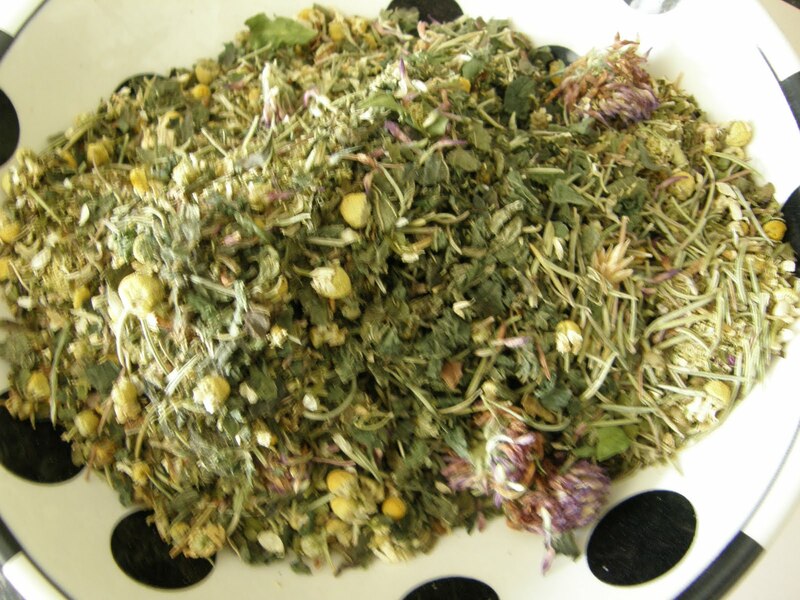 *Chamomile: Great for asthma, colic, fevers, inflammation, nausea, anti-inflammatory, anti-bacterial, anti-allergenic and has sedative properties. *Peppermint: Contains a compound known as perillyl alcohol that has been shown to inhibit the growth or formation of cancer. It has a another compound rosmarinic acid, a powerful antioxidant that blocks the allergy-producing leukorienes, the high content of this substance has been shown to help relieve that nasal symptoms of allergic rhinitis, (hay fever). *Rosemary: Is very useful for people with inflammatory conditions, such as rheumatoid arthritis, as well as bronchial asthma ans atherosclerosis. Rosemary also contains substances such as flavoniods and volatile oil that are useful for stimulating the immune system, increasing circulation, and improving digestion. Rosemary has also been shown to increase the blood flow to the head and brain, thus improving concentration. I was so glad when I found this recipe! I wanted a fun summery drink, and this fits the bill. I ran across this recipe in Bon Appetit magazine one day at the salon, my client Cindy and I are always talking about food and like to browse this magazine while her color is processing. This recipe appealed to me because it called for Limoncello which is a Italian liquor and for some reason I happen to have a surplus of, yeah for me! This recipe is easy, refreshing and was a huge hit at the unvailing of my mom and big Mike’s new patio. Even Mike’s tough guy buddy Fred loved it and he drinks nothing but beer. Try it soon while we still have some summer left. P.S. I use fresh honey from the Farmer’s Market, and the Jasmine tea I found at Whole Foods. Enjoy. The holistic nutrition school I’m attending (Bauman College) sends out newsletters to all there students on a regular basis, and this last on was filled with great tips and recipe for the up coming cold season. One of the mentions was the food blog Elana’s Pantry which is a gluten free blog, I took some time to check our her blog and loved it, I’m not gluten intolerant but I have friends that are and I want to be equipped to help them on there healthy food journey’s. So these next two recipes came from that blog and if you have time you should check it out for yourself. 1. Combine all the ingredients in a pot and place on the stove over medium heat. 2. Bring to a boil, turn down and simmer for 15 minutes. 3. Strain the tea mixture into 4 mugs, (or in our case 2 large mugs). 4. Serve hot with agave nectar, honey and almond or soy milk. To your taste. This is warm and soothing, I made it last Sunday morning when it was cold and rainy. It totally hit the spot and made the house smell wonderful. I can’t wait to make it again. 2. In a mixer puree oil, agave, eggs, and pumpkin until smooth. 3. Stir wet ingredients into dry mixture, (I do a little at a time, mix well and then add more until all is mixed together). 4. Place paper liners into muffin pans. 5. 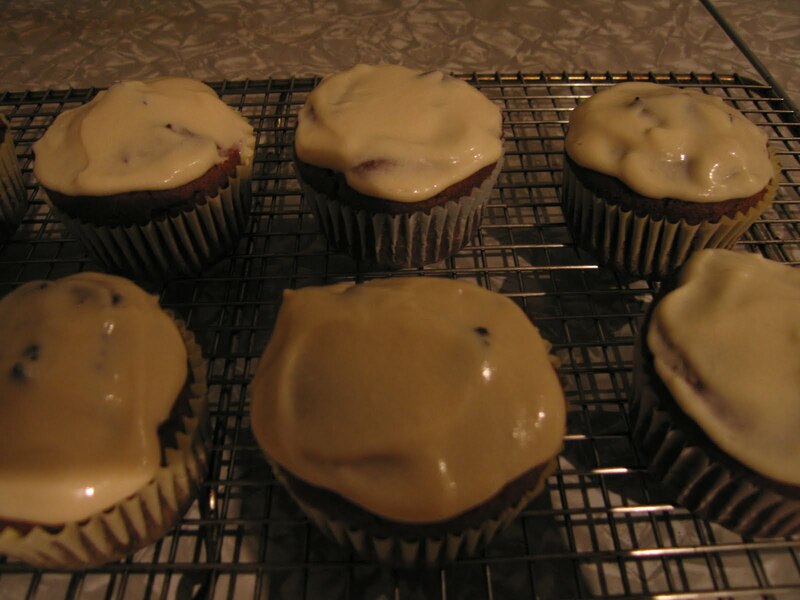 Scoop batter into liners, (I got 10 muffins). 7. Cool for 2-3 hours and then serve. These are awesome, and I shared them with friends. I topped mine with a cream cheese frosting, I just mixed organic cream cheese, vanilla extract, and organic powdered sugar just to taste. Who wouldn’t love these this time of year. Make a batch, Enjoy!